The Ako Incident, a story of such power that for 300 years it has held humanity in awe. My first comic book project will be a re-telling of this story. Starting shortly before Asano Naganori was called to the Shogun's court, and then moving through the tale, I am planning to release a full account of the incident and its legendary aftermath. So how does a guy who has never published a comic book before and who has no experience in the industry beyond having owned a comic shop, accomplish this feat? Like anything worth doing, there were and are problems to overcome. Problem number one, is funding. Alexia is a fantastic professional artist, and deserves fair pay for the huge work load of producing the art for this book. I'm a new publisher with a shoestring budget that isn't stretching longer very quickly. So crowdfunding is the logical choice in the development of this project. The plan is to launch a KickStarter campaign in September to fund the first book in the series, then subsequent KickStarters for the rest of the books in the series. 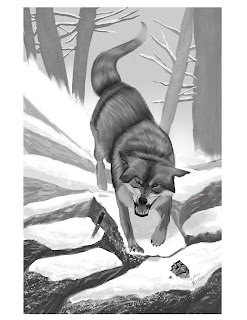 This has a number of great points, if successfully funded, and will allow Alexia to focus on her work as an artist and complete the book with great quality (see her online galleries and her work below) and in a timely manner. Creating and executing a KickStarter campaign is no guarantee of success. While the math isn't difficult, the calculus for success has a good deal of variables to account for. Finding and earning backers, balancing the reward calculations, accounting for Kickstarter costs, all add up. So for KickStarter goal calculation I needed to also account for art costs as well as formulate print costs to allow for physical backer rewards (read that as hard copy). I'm a big believer in digital media, but a print copy is something I genuinely aspire to achieve. The idea of people holding a copy of the comic book I wrote and brought to press is an amazing dream to realize. Funding levels will have to be met, and hopefully many people will want physical copies too. PrintNinja looks to the best option for print (that I've found so far anyway), but it will take a lot of backers to reach the funding levels needed. 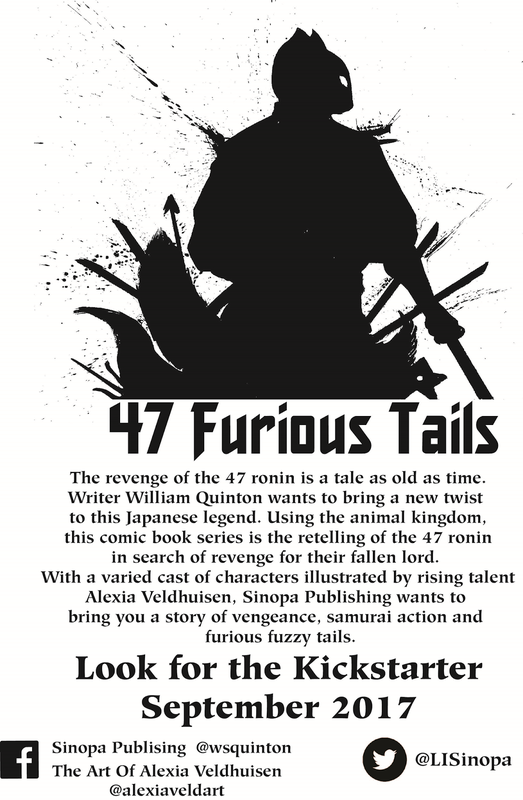 It may be a struggle, but my math says its possible to get 47 Furious Tails in print, but it does push the funding goal up. I've had very little experience with KickStarter. I just finished my first KickStarter campaign for a role-playing game adventure book I produced (Tale of the Wizard's Eye). That project funded even though I had no advertising and only a few days of lead up time (I basically did the entire beginning of the KickStarter badly with regard to hoping to finding people). Having the campaign fund so well was a great experience and a learning opportunity. While the adventure module had a goal of only $600, 47 Furious Tails will have a KickStarter goal of a few thousand dollars, so I'll need to find a lot more backers. While funding remains the chief problem I am hopeful that will careful promotion to spread awareness, solid feedback here (I hope), and two full months of lead time I'll have better hope of finding and earning backers for the book. Wish me luck on that. Problem number two, is the quest for perfection. The Ako incident is very well known and has seen versions in film and literature for years. With this book, I'll be sticking to the historical records as much as possible and attributing personality to the key players as the story unfolds. There will be no magic or oni, but there will be a measure of intrigue at court and a clash of personalities. So this will be a demanding book to complete, to say the least, not just from an art standpoint but also as a writer. Writing to meet the expectations of such a legendary tale is daunting and exciting. Writing to principle characters requires an understanding of the history of the incident, the traditions of the period, and translating the depth of character these samurai deserve. (No pressure, right?!) The records are very good with regard to the principle characters of the incidents, though many things have most likely been sensationalized over the span of 300 years. So I'm sharpening my quill, so to speak, and approaching the entirety of the story from a chronological outline of the events. The flow from one book to another is being measured out to provide a count of how many books will need be written and illustrated to complete the series. Will it take six books to tell the tale or will it need twelve? I'll be posting more on that later. Problem number three, is time. Writing takes time, and measuring out the time to produce a book in a medium you aren't accustomed to is difficult. So I've assessed the art production estimate from Alexia (who is a genuine professional, and whose judgement on this I trust completely) and padded out additional time to account for those little wrinkles life throws at all of us. Then Iv'e appended the print and shipping time expected for physical copies (yeah, PrintNinja! ), and subsequent fulfillment of backer rewards. Again each little thing adds up more time. Goals concerning the timetable include: production of character reference items, outlines, story overview, and (if possible) complete writing of book one by August 1st. With the KickStarter starting in September, Alexia will then do some teaser art so folks can get a taste of her art for this project. As the KickStarter progresses, we'll measure response and once/if it appears the project will fund then Alexia will advance the development of the art. A successfully funded KickStarter campaign would end in November, allowing for funds to be received at the end of November (and for art to be paid for, thank you Alexia!) and physical rewards for backers (hard copy) to be ordered from PrintNinja. Allowing for print runs, shipping of hard copy, and then processing and fulfilling backer rewards I would expect backers for the first issue to receive copy in March (or earlier if funding reaches a point that shipping can be expedited). 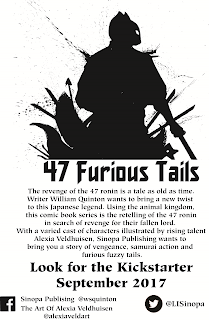 I hope you enjoyed this glimpse into the development of 47 Furious Tails. I want to thank you all for joining me on my adventure into publishing today. I do hope you will share this with others, (Please). You can find Sinopa Publishing LLC on Facebook, Twitter, and Instagram. Comments, suggestions, questions, and information are all most welcome.